“If there was anybody around there that did not play some instrument I did not see them... We played for rodeos, centennials, carnivals, parades, fairs, just bustdown parties, and played several nights and days a week just to hear our own boards rattle and our strings roar around in the wind. It was along in these days I commenced singing, I guess it was singing." 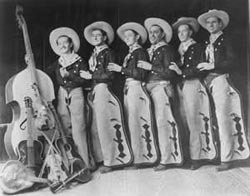 Woody (far left) with the Pampa Junior Chamber of Commerce Band, Pampa, Texas, 1936. In 1931, when Okemah's boomtown period went bust, Woody left for Texas. In the panhandle town of Pampa, he fell in love with Mary Jennings, the younger sister of a friend and musician named Matt Jennings. Woody and Mary were married in 1933, and together had three children, Gwen, Sue and Bill.